A Father’s Day gift for a rockin’ grandpa | spifftacular. My dad is awesome. He is hardworking, faithful, and wise. He is caring and supportive. And he is a pretty cool grandpa. His daily uniform consists of Chuck Taylors, cargo shorts, and a Hawaiian shirt or tie-dye shirt. He was an English major in college, but his speech is primarily composed of references from Monty Python, Fantastic Mr. Fox, and old SNL skits. And he could tell you a detailed history of just about every rock band in existence. 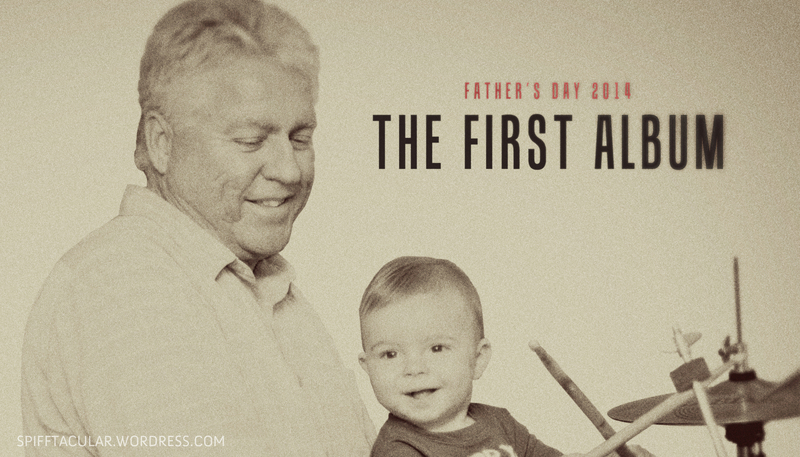 To honor his singular rockin’ style, I decided to design an album cover as a Father’s Day gift. On the wall of his office, Dad has a grid of framed album covers from some favorite bands. 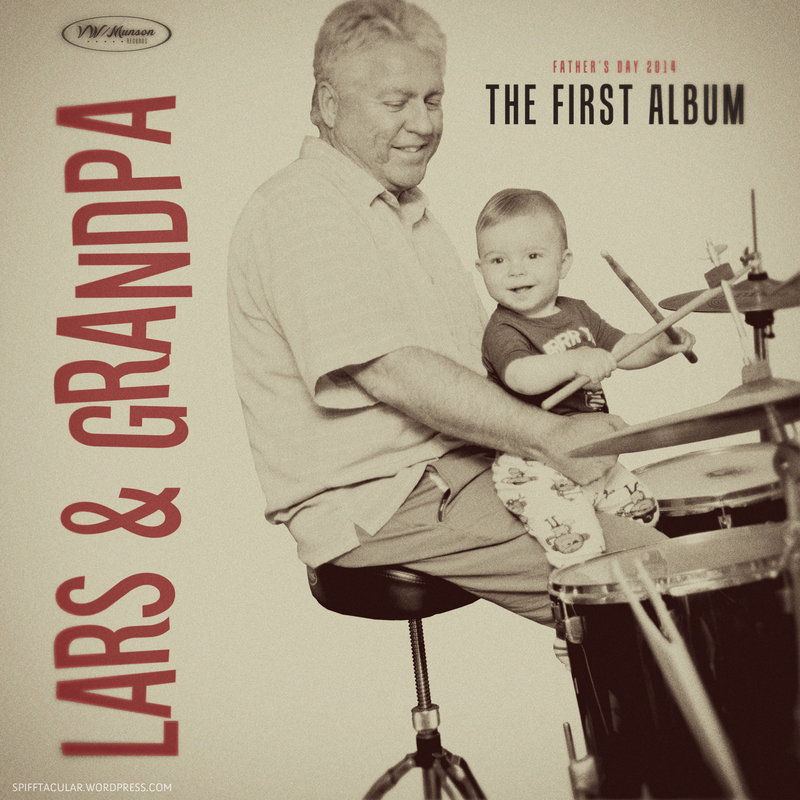 Last time we visited my family, my mom got some great pictures of Lars and Grandpa rocking out on the drums (mostly Lars enjoyed tapping the drumsticks together), and I knew it would make the perfect album cover. I decided to channel the style of the Beatles and other albums in the early ’60s. I even modeled my VW/Munson Records logo on the Capitol Records logo. I’m pretty pleased with how it turned out. Happy Father’s Day, Grandpa VW! Create a canvas of 12 x 12 inches. Paste the photo you want to use, and size it as you like. Add text layers. The typeface for “Lars & Grandpa” is Stereofidelic; “The First Album” and “Father’s Day 2014” is Tandelle; “VW/Munson” is Lakesight. Create an oval around the record label text. Create five stars and align them in a row. Make a copy of all the text layers, then make them invisible. Resize canvas (with anchor in center) to 14 x 14 inches (I did this to keep the action in the next step from blurring the image edges too much). Run the Pioneer Woman Vintage action (download the action set for free here). Crop the canvas back to 12 x 12 inches (with anchor in center). The text in the corners has probably gotten too fuzzy to read. Make the copy layers of the text visible now, and make sure it’s above the other layers. Play with the opacity (I had mine around 50%) of the layer until it looks less fuzzy. Print it! I printed mine at mpix.com, since they do a 12 x 12 size. You’re done! If you have any questions, feel free to comment and I’ll do my best to help.